The boy had his second birthday this week. We had a party with most of his grandparents, and all of his aunts, uncles, and cousins. 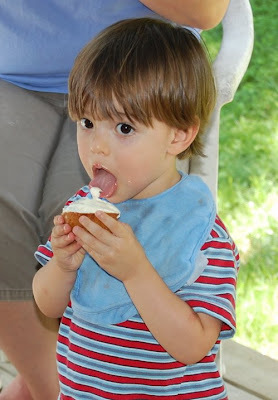 He really enjoyed the frosting, but neglected the carrot cake after that. 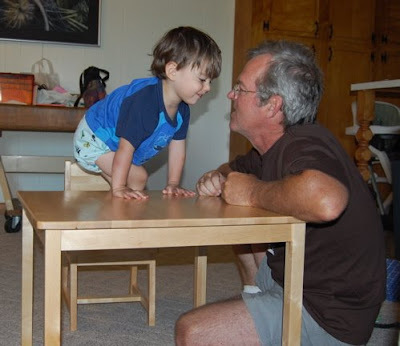 He got his own table and chairs, giving him yet another way to be higher. So far it hasn't occurred to him to move the chairs to other locations for climbing. We're not mentioning it! I can finally reveal some baby knitting since the shower is in a few hours. Sarah, if you happen to be reading blogs instead of playing with your family, move on now. Oliver will be the best dressed baby in NC! 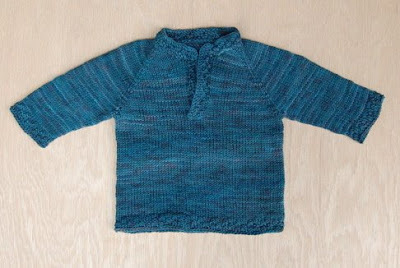 My own combination of the Child's Placket Neck Pullover and Barbara Walkers Top Down Raglan. Yarn is Dream in Color Smooshy in an unknown colorway. 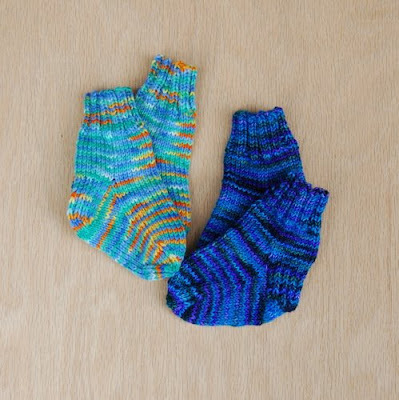 And every baby deserves some hand knit socks right from the beginning. Yarn on the left is my own hand dyed in Koi, on the right Interlacements Tiny Toes. Happy Birthday to your little guy! Can't believe he's 2 already! The sweater is indeed beautiful! I also love love love the yarn! Do you have a pattern for the baby socks? I am so glad the little guy is starting off with wonderful hand knits in his life. How fun to be born going into sweater season don't you think? oh happy day. little boy now, right? and welcome to 2...he has always seemed a bit more mellow than mine, here is hoping two is kind to you. i have to get me some of that dream in color, it looks so beautiful. lucky baby. I came over from Bridgman pottery. I saw potter/knitter and had to read about you. 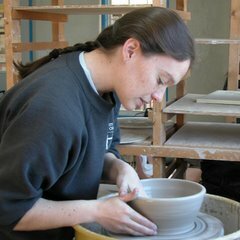 I love to knit, and have a lot of respect for potters. I would like to learn someday. For now, I will just read and oooh and aaahhh over the pottery!